English Porcelain: Please note that only a small part of our inventory is illustrated here. Please contact us for your specific needs. Worcester teapot with scattered floral spray decoration in polychrome enamels and gilt. A First Period Worcester sauce boat painted in underglaze blue in the "Two Porter Landscape" pattern. First period Worcester large mug transfer printed in underglaze blue with the Plantation Print. A first period Worcester punch bowl transfer printed in underglaze blue with rose sprays. A First Period worcester oval dish with "Rose Sprays" decoration. A Caughley porcelain scallop shell pickle dish in the Fisherman pattern. Two Caughley porcelain egg drainers in the Fisherman pattern. A group of three Caughley porcelain leaf form pickle dishes in the Fisherman pattern. A pair of Chamberlains' Worcester dessert plates painted with the arms of General Sir John Doyle. An English porcelain cabinet cup with bat printed neoclassical decoration after Angelica Kaufman. An English porcelain inkwell with bat printed decoration on an apricot ground. 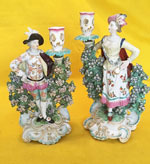 An assembled pair of Derby porcelain candelabra figures - The Ranelagh Dancers. An assembled pair of Derby porcelain figures - the Elements, Fire and Water. A pair of Derby soft paste porcelain figures of a shepherd and shepherdess. Derby soft paste porcelain porcelain putto with gilded decoration. 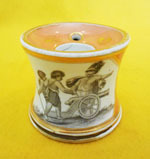 A mid 19th century lilac glazed porcelain pastille burner. 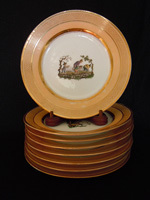 A set of 9 Royal Doulton elaborately gilded porcelain plates with hand painted decoration of game fish signed by C. Hollander. England, circa 1920-30. A pair of imposing large Paris porcelain beaker form cachepots painted with floral bands on a roe ground. A pair of fine Paris porcelain cachepots on stands painted with village and garden scenes on a dark blue "fossil" ground. A Continental porcelain framed floral tile painted in enamels. A French porcelain lidded potpourri vase modeled as overlapping leaves painted in green and gilt. Unmarked, but attributed to Jacob Petit. 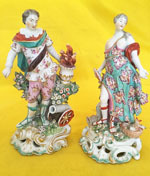 A fine pair of Vieux Paris porcelain chinoiserie figures painted in polychrome enamels and gilt standing on hexagonal fretwork bases. 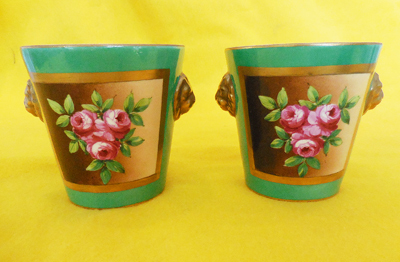 A pair of Paris porcelain handled cache pots painted with sprays of roses on an apple green ground. A French bisque porcelain lidded box molded with a portrait of Louis XVI within gilt brass mounts. A pair of Furstenberg porcelain reticulated fruit baskets with green enamel and gilt decoration. Samadet faience confiturier with painted floral decoration and acorn knop. A Continental pottery flask in the form of a pickle. Pr. 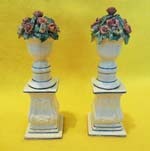 charming creamware floral urns on classical pedestals with polychrome applied leaves and flowers. Probably French, late 18th c.
A Dutch/German lobed tin glaze dish painted in underglaze blue with chinoiserie scenes. A Dutch Delft tin glaze plate painted in underglaze blue with a floral scene in the chinoiserie taste. Dutch Delft beaker vase painted with peacock feather decoration. A Dutch Delft tin glaze plate painted in underglaze blue with a floral spray. A Dutch Delft tin glaze charger painted in polychrome with a central figure of Flora. De Porceleyne Klaeuw factory, 18th century. 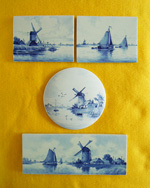 A group of De Porceleyne Fles Delft placques with hand painted landscape scenes. A fine early Creil reticulated basket and stand transfer printed in black with Napoleonic emblems.